The MIT Sustainability Office is working to meet the challenges presented by the changing planet. They are looking to create a model that can be used at a global level. The office wants these actions to transcend and be accessible to all levels of the campus. The biggest challenge for this website was the organization of the data information. We had to ensure that all sections were well organized to show the data visualizations. All information needed to be accessible to all practices on campus. As a first step, Graphic designer, Ellery Curran created a filter system. The information would be filtered into the sustainability area and then into topics. Using filters across the website was key to connecting data and visualizations. It is paramount in producing a useful website to work closely with the client to understand their needs as well as the site users needs. Our web developer, Yuriy Mantulin used Drupal as the CMS to organize and allow the client to maintain the cross references and tag content easily. If a site is not easily maintainable, it is not useful for the client. Having a web developer here in the office to work closely with the designer helps move our projects forward seamlessly. Ellery designed the data visualization page with a thumbnail of the visual, a title, the filtering system, and a summary. This worked great with the visualizations, the thumbnail allows a glimpse into the data presented. The data sets were designed into a table with a drop down of more information. The table allows the relevant information to be available at a glance with details in the drop down. 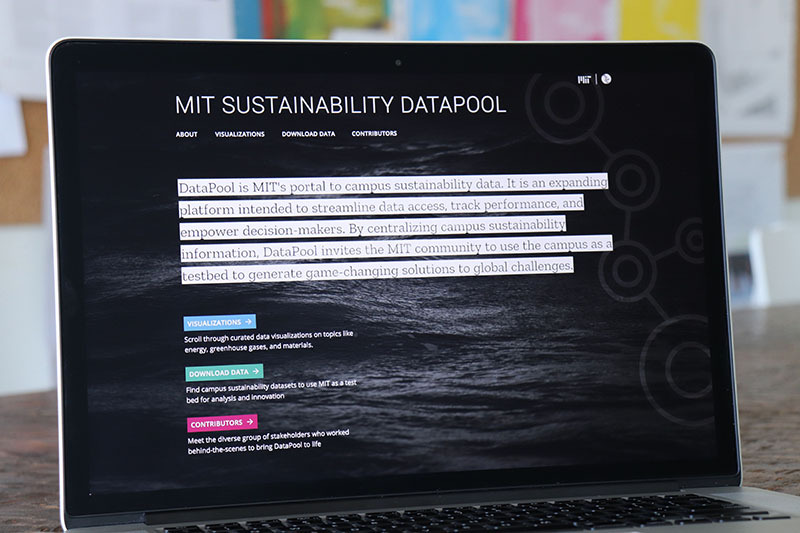 With the website complete and the clients pleased, MIT can now collaborate their sustainability actions across campus with a click.